If you want to become a successful financial adviser, there’s no way around it. At some point you’re going to have to get up in front of a room of people and deliver a talk. There might only be five or 10 people in the room. Or there might be 100 or more. Either way, you need to be able to deliver an engaging and persuasive talk that connects with your ideal prospects and prompts them to want to set an appointment with you. 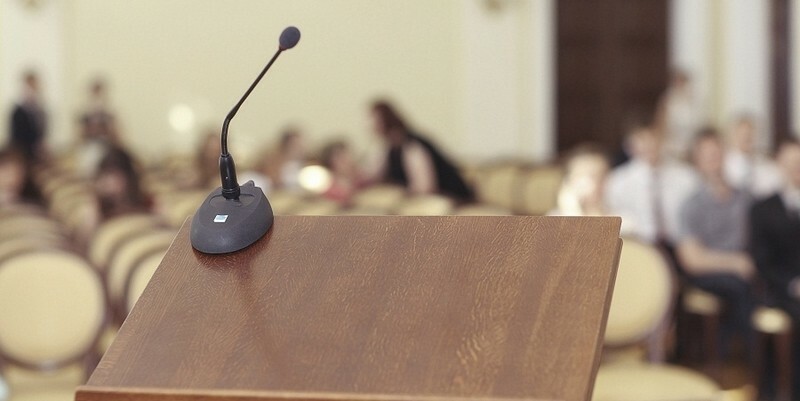 One reason financial advisers avoid giving talks is because of nervousness and not knowing how to handle it properly. With that in mind, I want to tell you about some of the tips and techniques I recently learned from Scott McKain, a speaker I recently had the pleasure of interviewing. Many years ago, Mr. McKain had a mentor in the speaking business. Mr. McKain admired him because he always seemed so relaxed when he got up to speak before a crowd. One time, when they were driving home from an event, Mr. McKain told his mentor about his own problem with nervousness. With that in mind, Mr. McKain offered these three simple tips for managing and controlling the nervousness you might feel when you get up to speak in front of an audience. Tip 1: Know your open cold. While Mr. McKain doesn’t think you should have your speech totally memorized from start to finish, he does believe you should know your open cold. In fact, he says you should have both your opening phrase and closing phrase 100% committed to memory. Why is this important? Because if you know your open cold and rehearse it over and over again, you’ll be able to sail through those first couple of minutes when your nervousness is strongest. As you deliver your opening, you’ll get more comfortable speaking, your nerves will calm down and you should then be able to handle the rest of your speech without any issues. Tip 2: Get audience participation early. No audience wants to sit for an hour listening to a boring presentation. They don’t want to try to stay awake while listening to fund performance figures or dry information. Chances are, you wouldn’t want to either. This is why you should aim to get your audience involved early in your speech. Ask them questions, get them to participate, tell them stories that activate their imaginations. Do this and they’re going to be far more interested and engaged in what you’re saying. Naturally, an interested and engaged audience will also lead to more first appointments. Tip 3: Have a plan for dealing with a joke that flops. Can you imagine how nervous you’d feel if you told a joke and nobody laughed? This actually happens more often than you might think. Humor is one of the most difficult things to use effectively. This is because everybody’s sense of humor is different and it’s hard to tell a joke that resonates with everybody. But if you are going to tell a joke, Mr. McKain offers this advice: Humor should only be used to illustrate a serious point. This way, whether your joke works or not, you have a smooth transition into something meaningful, and the story you just told supports the point you’re making. This minimizes the awkwardness of the moment and any nervousness you might feel. More important than having a plan for dealing with a joke that flops, is being willing to edit out questionable material from your talk. Mr. McKain puts it this way: If in doubt, leave it out. This applies to jokes and anything that might offend your audience. The last thing you want to do is offend a prime prospect who would have done business with you — but decided not to because of something offensive you said. By the way, the speaking tips in this article are a small fraction of what Mr. McKain shared during my interview with him. Click here to listen to the full hour-long interview. This post originally appeared on InvestmentNews.com. The information and opinions contained herein are provided by third parties and have been obtained from sources believed to be reliable, but accuracy and completeness cannot be guaranteed by Advisors Excel. Scott McKain is not affiliated with or sponsored by Advisors Excel. For financial professional use only. Not to be used with the general public or in a sales situation.